We’ve all seen the movie. Confronted with a menacing force that threatens the existence of life on Earth, humanity sets aside its national differences to unite around the common cause of saving the planet from annihilation. Well right now, it’s really happening; we’re living through the scenario we’ve seen so many times before on screen. Except the force that threatens our existence isn’t an alien invasion—it’s climate change—and the response from mankind has been less that inspiring. So why hasn’t our species come together, in dramatic fashion, to save the day? It comes down to money. Fossil fuel executives and the politicians they bankroll have presented a false choice between a healthy economy and a healthy planet. They’ve successfully framed the debate in the language of austerity and sacrifice, of poverty and suffering. In short, too many of our leaders have come to believe that saving the planet will ruin the economy. In reality, it’s the only thing that can fix it. As an entrepreneur who has devoted much of his adult life to ending poverty, I believe that the U.S. economy is fundamentally broken. Power and wealth are increasingly concentrated at the top, while many Americans are working longer hours, for less money and fewer benefits. For them, the problem isn’t finding employment—it’s that a job alone is no longer enough to provide for a family or even stay out of poverty. That’s why I’ve spent the last four years working to expand and promote the earned income tax credit, or EITC. It is designed to encourage and reward work by supplementing the earnings of low wage workers, putting money directly back in the pockets of families who need it most – those among us who often work the hardest, but earn the least. In 2016, the EITC lifted about 5.8 million people out of poverty, including about 3 million children. The EITC is widely recognized as the single most effective tool we currently have to alleviate poverty in the United States. Yet it’s still not enough. If we’re going to unrig the system and make it work for everyone, we have to transform every aspect of the economy, and rebuild it from the bottom up. Luckily, the massive set of investments required to address climate change, called the Green New Deal, gives us an opportunity to do exactly that. We’re talking about a full-scale mobilization of the economy—of both the public and private sectors—on a scale we haven’t seen since World War II, and with it, the opportunity to fundamentally shift the economic balance of power, strengthen workers’ rights, and create widespread prosperity for the 21st century. Making the transition to a carbon-free economy is going to require a massive workforce. 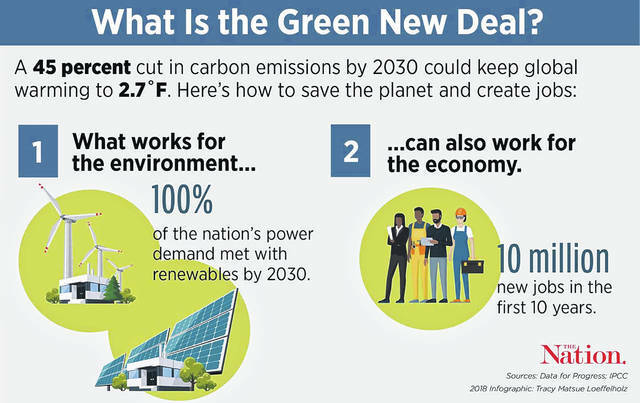 The Green New Deal would create tens of millions of jobs, from installing solar panels to retrofitting buildings, from manufacturing electric vehicles to reforesting public lands. An emerging consensus among economists argues that only massive and sustained investment in the real economy, not stimulus or tax cuts, can raise stagnating wages and permanently revive American prosperity. And a comprehensive Green New Deal plan would include measures for encouraging unionization, supporting local business, worker ownership and co-ops, and for paying a living wage and even a true middle class wage. If we can ensure that these are good union jobs that pay a living wage, with benefits and a reasonable work week, it will establish an effective wage floor and put upward pressure on wages and benefits across the economy. If employers want to compete for labor, they will have to reverse the trend of maximizing their own profits by giving workers less and asking for more. To spur hiring and encourage growth in the private sector, particularly in the emerging green economy, we could create a supplemental ‘Green EITC’ to provide wage subsidies to employees at any company that is carbon-neutral. This would simultaneously make work pay better while giving those employers a competitive advantage when it comes to hiring, creating a demand-driven push for companies to achieve zero net emissions so that their employees would qualify. Transitioning to a zero-carbon economy is also going to require massive public investments in everything from electric vehicle charging infrastructure to modernized mass transit and carbon-free public housing. It is critical that we avoid repeating the sins of the original New Deal, which in many ways served to perpetuate and exacerbate racial discrimination and inequality. Rather than handing over funds to a handful of politically powerful and well-connected monopolies, we have to prioritize communities that have suffered from racial discrimination, those set to experience the worst effects of climate change, and the areas dependent on the fossil fuel industries that will have to be phased out. To further ensure that the Green New Deal creates prosperity well beyond the elite enclaves of New York City and Silicon Valley, we could use the model of Opportunity Zones to encourage private investment to do the same. Finally, if we’re going to confront climate change on the scale that this crisis demands, we’re also going to have to drop the absurd notion that every government investment must be accounted for, dollar for dollar, with new revenue or cuts in spending. The bottom line is that when it comes to climate change, the most expensive thing is doing nothing. Our politicians will continue doing precisely that, however, as long as they hold on to the false notion that saving the planet is bad for the economy. The truth is that the Green New Deal is a once-in-a-lifetime opportunity to end poverty and remake our economy so that it works for everyone. We cannot let it go to waste. ABOUT THE AUTHOR: Joseph N. Sanberg is the Founder of CalEITC4Me and Co-Founder of Aspiration.com. This piece originally appeared in The Nation. ABOUT THE WRITER: Bill O’Keefe is the founder of Solutions Consulting in Midlothian, Va. He wrote this for InsideSources.com. New York senator and 2020 presidential candidate Kirsten Gillibrand has joined the chorus of high-profile Democrats announcing their support for the “Green New Deal,” an aggressive (and expensive) proposal to de-carbonize America’s economy. “The way I see a green economy is this: I think we need a moonshot. We need to tell the American people, ‘We are going to have a green economy in the next 10 years, not because it’s easy, but because it’s hard, because it’s a measure of our innovation and effectiveness,’” she said on the “Pod Save America” podcast this week. Her representative said Tuesday that this is merely a reaffirmation on her previously-held position. The Sierra Club, the Natural Resources Defense Council, the Environmental Defense Fund and the Audubon Society. Despite calls from green activists like the Sunrise Movement — famous for organizing protests outside Speaker Nancy Pelosi’s office on the first day of the new Congress — the California senator has thus far declined to fully endorse the GND. Harris’ representative says the senator is on board for the “goals of the Green New Deal,” but that doesn’t appear to be enough for the green movement in general. 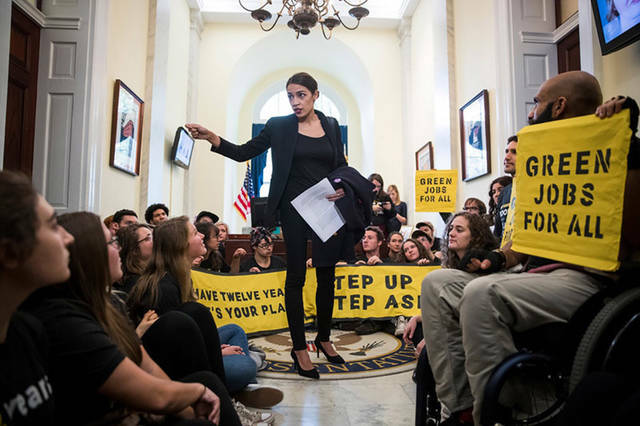 “Having presidential candidates say they are supportive of the concept of doing something like the Green New Deal is amazing, but it’s not sufficient,” Saikat Chakrabarti, chief of staff to Ocasio-Cortez told the Washington Examiner. ABOUT THE WRITER: Michael Graham is political editor of NH Journal. He is also a CBS News contributor. He wrote this for InsideSources.com.